Father Benjamin D'Souza's rain harvesting measures in four acres of the Tallur Church campus in coastal Karnataka have assured zero runoff for the last half a decade and watered neighbouring wells too. Shree Padre reports. Love thy neighbour as thyself. A church in Karnataka follows this proverb in a novel way. Saint Francis Assisi Church of Tallur, a coastal hamlet by the side of NH 17 near Kundapura, has blessed at least five of its neighbours with ample water. Wells of four adjoining families and a public well that had considerable water shortage for years now have good water even at the end of summer. 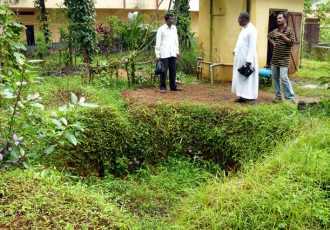 This is the result of wise rainwater harvesting measures by the churchs (parish) priest Father Benjamin D'Souza, 70. Since the past half a decade, the churchs four-acre campus has had zero run-off. This means that it doesnt send any rainwater outside its compound walls. Going by the numbers, with the districts 3500 mm average rainfall, this priest is now putting 5.6 crore litres of water back into mother earth's womb. The Tallur church can be showcased as a successful model for RWH in the district of Udupi. Fr Benjamin shows the percolation pond inside coconut garden. Pic: Shree Padre. It was in 2002 that Fr Benjamin was transferred to this church. He recalls, At that time, water was flowing out of the compound through 15 different points. The first thing I did was to plug them. An avid reader of articles on RWH and nature conservation, he had even organised a seminar on the subject in this church way back in 2002. But it drew only lukewarm response. However, he continued his efforts undeterred. Fr Benjamin was determined to show people how to harvest rainwater. There were two open wells in the church compound. One was totally dry, the other one that was bigger, too used to dry up by March. Step by step, the priest checked all the rainwater by using various methods. All the run-off from one side of the church building is diverted to the dry well. This well doesn't dry now. Rest of the water that falls in the area is led to another infiltration pit. Many small pits spread over the area dont allow water to run off very far. In addition, contour trenches inside the coconut garden check the rainwater then and there. Tallur church observed this Independence Day in a different manner by organising a rain harvesting awareness programme. A citizens' steering committee has been constituted to spread awareness and action in the district. Apart from the church, this campus has two more big buildings. On the front side, touching the road is Saint Philomena Higher Secondary School. The schools meeting hall is housed on the left side of the main gate. Roof water from both these buildings are made to walk in a roundabout route before finally sinking in a farm pond specially dug for the purpose. A portion of roof water is stored in a 15,000 litre ferro-cement tank. In the early years, this helped provide water when the well was empty. A Mangalore based NGO, CODP India (Canara Organisation for Development and Peace), offered financial and technical help for this system. Fr Benjamin has intelligently made roof water from the nearby buildings to take a long, winding route inside the coconut garden before finally percolating it. This process increases the sub-soil moisture and helps in the growth of coconut trees. The coconut and pepper wines are now yielding far better. Over the years, the groundwater levels have been raised considerably. Now, the roof water harvesting system is more for a demonstrative purpose, points out Fr Benjamin. This rain pit arrests excess water that flows from the previous barriers. Pic: Shree Padre. In the lowest area of the campus, an earthen bund has been raised to stop whatever overflows may pass the earlier barriers. I call this as a madaka. This is my Krishnaraj Sagar, describes Benjamin jovially. A water diviner who visited the site recently, tells Benjamin, has predicted that if an open well is dug very close to this bund, it would provide ample water. Instead of digging a new well, Benjamin is planning to utilise the rejuvenated old well after cleaning. Fr Benjamin shows the corner of the plot saying, We were sending all the water out a decade ago. Come with me, I will show you how we are taking it in now. On the side of the compound, a new trench has been dug. 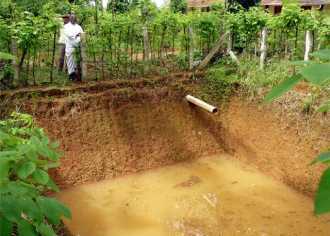 This brings water from about one and half acres of neighbouring public playground, points out Vasantha Shetty, a panchayath member who takes keen interest in water harvesting. This step imports not less than 2.5 crore litres of water! Benjamin has initiated work on a new infiltration pit to percolate this 'imported' water. Now our land is habituated to 'drinking' the runoff water. As such it doesnt allow much water to run away, he says, explaining in his own humorous style. Lot of grass and small plants keep covering the land for a longer time of the year. Dry leaves that fall on the soil have made it more fertile. These changes have increased the water percolating ability and water holding capacity of the soil a great deal. Neighbouring open wells of Praveen Pereira, Antony DSilva, Sarfin Andrade, Catherine Almeida and one dug by the panchayath for public purpose don't dry now. Out of this, Pereira's is a touching example. The Pereiras had bought this site three decades ago. Since then, the open well had been drying for two months every year. Pereiras well is on the opposite side of the road, in front of the church. Fr Benjamins total water harvesting has increased the water level here too. Since the last two seasons, Pereiras havent stepped out of their compound to fetch water. During the beginning years, many people grumbled and opposed Fr Benjamins rain harvesting moves. We dont have to harvest rain in this heavy rainfall area, was one common criticism. Weekly visitors to church for Sunday prayers complained that the standing water here and there was a nuisance. A few parents were of the opinion that the rain pits would pose danger to the students studying in the adjoining school. Did the students complain? Never, laughs Fr Benjamin heartily. They understand the issue far better. Its only the parents who are late in realising. Now the convinced neighbours are happily following rain harvesting using low cost measures. Fr Benjamin has grown around hundred types of medicinal plants here. Raising a mini forest in the campus is his next objective. Birds and snakes should come here freely, he hopes. His zeal for greening is evident in the churchs graveyard too. Planting large trees would pose practical problems here. As such, he has raised a nursery and hundreds of now famous medicinal Noni (Morinda citrifolia) plants here. Thanks to Noni, people visit this graveyard too, he says. The priest uses any available occasion to introduce the concept of rain harvesting in particular and environment in general to hundreds of his school children. During free time, I encourage them to come here, see all the measures we have taken to arrest the rain inside the compound, he says. Apart from harvesting rain in the church, this priest has taken initiative to spread it outside. It was his inspiration that has made some poor families to harvest roof water in the nearby salinity-affected riversides. Tallur Church observed this Independence Day in a different manner by organising a rain harvesting awareness programme. A citizens steering committee has also been constituted to spread awareness and action in the district.